Mohammed al-Guerbouzi, a British of Moroccan origin, who was given asylum in Britain, has filed a lawsuit against the British media for naming him as a suspect in the London bombings, reported the Moroccan daily, Assabah. Assabah said, quoting 'credible sources', that several British media have received notifications from al-Guerbouzi's lawyer, stating they are being sued by the latter. 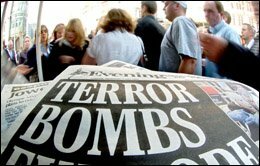 Al-Guerbouzi denied earlier any involvement in the London bombings which targeted the English capital on July, 7, 2005. "I am not hiding and I am not a terrorist," Muhammad al-Guerbouzi told al-Jazeera two days after the bombings. "These are all lies. They have made up this story," al-Guerbouzi added. He accused someone at the Moroccan embassy in London, whom he refused to name, of being behind the allegations that he had links to groups described as terrorist. In the al-Jazeera footage, al- Guerbouzi is heard speaking while his bearded face is barely visible through a celluloid shadow the television network used to shield his face. The British tabloid The Daily Mail appeared on July 9, 2005 with a front-page banner headline: "Is Moroccan mastermind of the plot?" London media reported that the request for details on the 45-year-old father of six, who has a British passport after being granted asylum in the mid-1990s, was sent by British police to European counterparts shortly after the three rush-hour Underground explosions and one bus bomb on July 7. In March 2004, Spanish detectives investigating the bombing of commuter trains said that Moroccan Jamal Zougam, 31, one of the suspects of the Madrid blasts, made telephone calls to al-Guerbouzi's fixed and mobile phone lines in London. Investigators also claimed that al-Guerbouzi disappeared shortly after he was phoned by the Madrid cell. He left Morocco with his family in 1974 at the age of 17 to settle down in London. He had been living in Kilburn, North West London, as a student of the militant cleric Abu Qatada. The cleric is among the twelve foreign terror suspects that the British government decided to deport last August. The London-based Asharq al-Awsat reported last year that al-Guerbouzi was close to a group that used to send Muslim volunteers to Bosnia to fight the Serbs during the Yugoslavia civil war and to Chechnya to fight the Russians. Mohammed Darif, a Moroccan political analyst and expert in Islamist groups has cast doubt over al-Guerbouzi's involvement in London blasts. “I don't think al-Guerbouzi is linked to London blasts, because he was watched by the British police, and was wanted for the Casablanca and Madrid attacks. Al-Qaida normally deals with people who have no criminal records,” Darif told Morocco Times. The Moroccan analyst thinks there are two main reasons why the British media have jumped to accuse al-Guerbouzi of involvement in the London blasts. “First, the media have noticed that Mohammed Bouyeri, Theo Van Gogh's killer, has used some expressions from Ben Laden's speeches. Second, after the attacks in Casablanca and those of Madrid, some prejudices began to develop about Moroccans. These allegations were backed up by Western media and especially Moroccan authorities, who arbitrarily detained hundreds of people. The Moroccan media talked about those Moroccans who became terrorists as if there were many of them,” he explained. Darif stressed that the fact of mentioning Moroccans in every attack (in Madrid, Saudi Arabia...), and raising the issue of the Moroccan Islamist Combatant Group (MICG), contributed to the allegation that Moroccans are terrorists. “So the media started talking about the MICG. As Madrid's attackers were Moroccans, the media established the link between other cells and the suspected leader of the MICG, Mohammed al-Guerbouzi,” Darif said. Morocco and the UK examined last July the extradition of al-Guerbouzi during the visit of the UK FCO minister, Kim Howells on July, few days after the London bombings. Moroccan authorities had already required his extradition, but the British government refused because he is holding British citizenship. Besides, there is no extradition treaty between the two countries. The FCO minister indicated that experts of the two countries are examining the means and the protocol of this extradition which must be carried out in total respect of human rights.